The tagline for World of Tanks' newest patch is "Size doesn't matter when you carry a big gun." A bold claim that may prove true with the addition of new, Tier 10 Medium tanks and Tank Destroyers. Check out the world-exclusive reveal of the patch trailer below. 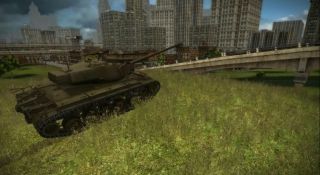 There is no official release date for the 7.5 update yet, but considering it's a game about tanks blowing one another up in large quantities, I imagine we'll hear it coming.